Let's talk about these little lovelies shall we?? These shoes are going to be my new favorites, I can already tell! If you're into fashion blogs you have probably seen them on lots of big name blogs (Ivory Lane, Cupcakes & Cashmere, Pink Peonies) which usually reads out of my price range. But sometimes other bloggers find knock off shoes that are exactly the same that are on sale for $30, and then tell you about it on Instagram! (thanks Emily and Laura!) Well this weekend I was shopping with my sister, Wendy and went into Torrid to see if they had them. I tried them on and it was pretty much fate. You know when you probably don't need another pair of shoes but then you try some on that make you feel like a million bucks and you have to buy them right then because if you don't you'll think about them every second of the day until you do? Just me? That's cool. But seriously, I love these shoes because they make me feel like a true fashionista, I mean how could hot pink, studded heels not?? Expect to see these babes on repeat this summer! ps I loved these little pink and white flowers I was taking pictures in front of so I decided to snap a few pics, they are so pretty and dainty! Aww...pretty pictures! I love that you're wearing a red lip! Brightens up the whole look! Visiting from Funday-Monday! Love these shoes, so fabulous that they were on sale too! WOW! I'm beyond excited that these shoes are NOT the million dollar pair that the other bloggers are wearing - absolutely love them on you! Thanks for sharing the cheaper option! Visiting from FundayMonday! Love the shoes! I just bought them too and I can't wait for them to come!!! I'm looking for all the styling ideas I can get with those lovelies and this one is perfect! Those shoes!!!! Oh emm gee! They are gorgeous and totally 100% drool worthy! I am obsessed with how you styled them, too! 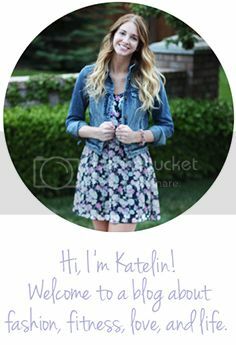 Katelin, I'm pretty much obsessed with your entire wardrobe, and your hair...and you! Eek! Love your blog! Thanks for the inspiration!!!!!! looking good missy!!!! Glad you had such a cool sister to go shopping with!!!! I've had my eyes on those shoes (well, the knock offs) for some time too. And I totally agree, just because we don't "need" another pair doesn't mean we don't neeeeeed another pair! I love your shoes!!!! I definitely thought they were Valentino's at first!
" You know when you probably don't need another pair of shoes but then you try some on that make you feel like a million bucks and you have to buy them right then because if you don't you'll think about them every second of the day until you do?" Yes. Yes I do. Shopaholics unite! Love love love them!! So happy you were able to get them! I wore mine again last night. ; ) Love with them with the pants and chambray. You look beautiful!!! Thank you so much for linking up!